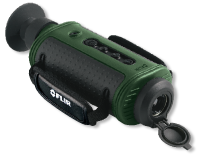 The FLIR Scout TS-Series are rugged handheld thermal imaging cameras that have been especially developed for wildlife observations and hunters. Thermal imaging cameras need no light whatsoever to produce an image. They help you to see clearly at night, in practically all weather circumstances. After sunset, a lot of animals are active. With the help of a thermal imaging camera like the TS-Series you will be able to monitor their activities. The TS-Series will not only help you to find animals in total darkness but during daylight as well. Thermal imaging cameras make extremely small temperature differences visible. Based on these temperature differences they create a clear image. Furthermore, thermal contrast is extremely difficult to mask. This means that during daylight you will clearly see animals that are hidden in trees or bushes. Their natural camouflage will not help them to hide anymore. Thermal imaging cameras are widely used by professional documentary makers and hunters worldwide. Until now they have been extremely expensive. The TS-Series are now bringing thermal imaging cameras within reach of nature and wildlife enthusiasts and for hunters. The unique InstAlert feature colors the hottest parts in the thermal image red. This makes it extremely easy to spot animals in the thermal image. The TS-Series produces thermal images of 240 x 180 or 320 x 240 pixels on which the smallest of details can be seen. Advanced internal camera software delivers a crisp image without the need for user adjustments. The TS Series is available in a Basic and a Pro version. The Pro versions contain useful features such as still image and video storage. The images and video can be used to insert in your own video or photo collection. The TS-Series are providing a 24° field of view. It offers an excellent combination of range performance and situational awareness. A deer for ­example can be spotted at about 450 meters away, in total darkness. For situations where ­longer range performance is needed a 2X extender is available. It spots a deer at ­approximately 790 meters. For even longer range performance, the TS32r is available. It is equipped with a 7° lens. Due to the narrow field of view it can be used to spot a deer at about 1,450 meters away. The TS-Series come standard with a “Hot Shoe”. Not only does it allow for tripod mounting of the TS-Series it also has a power in and video out jack. This means that you can put the TS-Series in a certain position and follow what is happening from a hidden location, on a large monitor. The shuttered eyepiece keeps light from coming out of the viewfinder and avoids alarming animals or other target subjects.